This Clipboard Could Save Your Life | OhGizmo! By David Ponce on 11/08/11 • Leave a comment! Say you’re a police officer. Or simply someone with a knack for walking into the line of fire. You’re going to want to put the odds on your side and protect yourself. Sure, police officers usually wear vests. But they also carry clipboards, don’t they? Like for when they’re writing you a ticket? So what if that clipboard… wait for it… could also stop a bullet? 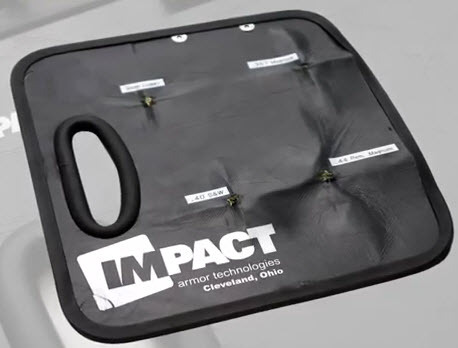 That’s exactly what the Ballistic Clipboard from Impact Armor Technologies does. It’s rated to exceed NIJ IIIA specifications, which means it gives multi-hit protection from 9mm, .357, .40, and .44 mag rounds. Best of all, it has a handle and weighs less than 2.0lbs. Awesome, right? Well… We’re not exactly sure how this works. What scenario could this be used in? Would the officer be expected to raise it up to his face in case a gun is pointed there? Is he expected to swat the bullets away? We’ve just never thought of ballistic armor as something movable; it’s usually affixed to your body. But hey, you can never be too safe, right? If that makes sense to you, it’s $150.